PICT (Pune Institute of Computer Technology) is considered in the top 5 engineering colleges in Pune for the branches – E&TC, Computer Engineering, and Information Technology. Located in Dhankawdi, it can sometimes get tricky on how to reach the college. So, here are some ways of reaching PICT from different corners of Pune City. • Head towards Ghorpade Peth road. Turn left towards Jagannath Shankarsheth Rd. Turn right at the 1st cross street onto Jagannath Shankarsheth Rd and continue straight for 0.5 kms. • From Swargate chowk, Use the right lane to turn left onto Narveer Tanaji Malusare Rd/Pune – Bengaluru Hwy/Pune – Satara Rd/Satara Rd and take the adjoining flyover. Continue straight onto Pune – Bengaluru Hwy/Pune – Satara Rd/Satara Rd. • Turn right at Rajiv Gandhi Chowk onto Khashaba Jadhav Path. Turn right at Pune Kashmir Maitri Chowk towards Medical College Rd. Continue straight and take the next right to reach the college on the right. 230, 24, 216, 213, 235, 301. 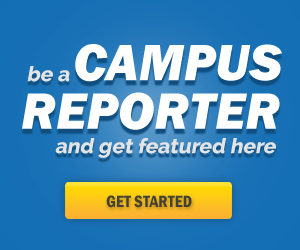 Get off at Bharati Vidyapeeth Bus stop and walk for 5 mins to reach the college. READ ALSO – 13 things to know about PICT that no one tells! • Take the Pattinson road and turn right from Bishop’s Ground on the right. Through the roundabout ahead take left onto General Bhagat Marg. • At the next chowk continue straight. After Talab Park on the left Turn right onto Stavely Rd. Turn left onto Napier Rd then turn left onto Parvati Rd. you will pass by Ex Servicemen’s Contributory Polyclinic on the left. • After little Italy restaurant turn right onto Bibwewadi Kondhwa Rd and continue straight for 2kms. After you see HDFC bank on the right, turn left onto Shree Suvarna Bank Rd. Turn right onto Keshaorao Jedhe Rd. • Turn left onto Pune – Bengaluru Hwy/Pune – Satara Rd/Satara Rd and continue straight for 3kms. Turn right at Rajiv Gandhi Chowk onto Khashaba Jadhav Path. Turn right at Pune Kashmir Maitri Chowk towards Medical College Rd. Continue straight and take the next right to reach the college on the right. • From Mamadevi Chowk take 301 bus ( Katraj Bus Depot) . Get off at Sarpodyan and walk 15mins towards PICT. • Head towards KBS road. Make a sharp right at Finolex Chowk onto Kamala Cross Rd. At Pimpri Chowk, take the 2nd exit and get onto Old Mumbai rd. Use the right 2 lanes to turn slightly right onto NH60 and continue straight for 7-8kms. • Exit onto MH SH 114. Use the left 2 lanes to turn slightly left onto Chhatrapati Shivaji Maharaj Rd/Shukrawar Peth – Mahatma Gandhi Rd and continue to follow Chhatrapati Shivaji Maharaj Rd for 2kms. • From Pune Junction take the EMU Pune Local ( 99830 Lonavala) get off at Shivaji Nagar stop and walk towards Shivaji nagar S.T. stand. • Take the bus no. 296/2 and get off at Rajaram Gas agency stop or Sarpodyan. • Then walk for 5-10 mins to PICT college. • Head towards Magarpatta Rear Approach. Continue onto Magarpatta City to Koregaon Park Back Side Rd. Turn left onto BG Shirke Rd then take the next left and continue straight 1km. Turn right onto Rd to Hadapsar MIDC. • Rd After central bank of India Turn right after Sai Car Bazaar (on the right) Continue to follow Mumbai Hwy/Mumbai – Pandharpur Rd/Pune – Solapur Rd/Solapur Rd/Solapur – Pune Hwy/Pune – Pandharpur. Continue straight through Mamadevi Chowk onto Mumbai Hwy/Mumbai – Pandharpur Rd/Pune – Solapur Rd/Solapur Rd. • Continue straight through Indira Gandhi Chowk onto Jagannath Shankarsheth Rd. Keep right to continue on Shankarsheth Flyover and merge onto Merge onto Jagannath Shankarsheth Rd and continue straight. • From Magarpatta bus stand take bus no. 301/15/180 and get off at Sarpodyan bus stop to walk towards PICT College. 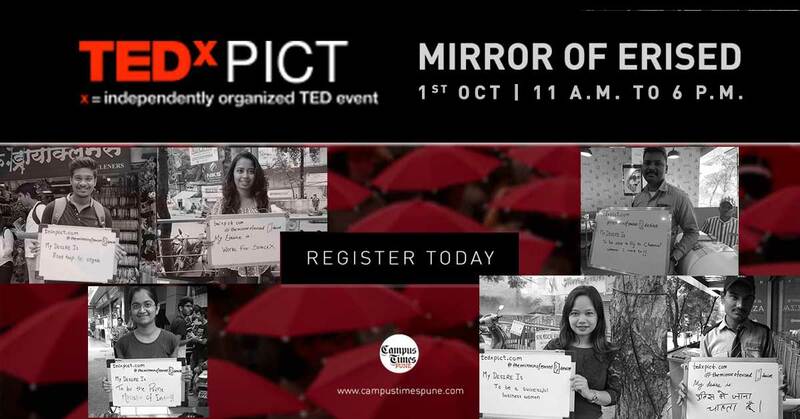 Among all the TED talks Pune in 2016, TEDx PICT is taking place on 1st October. This year theme is Mirror of Erised which has hidden meaning.